An international bestseller Over 80 million copies sold worldwide A PBS Great American Read Top 100 pick A special 25th anniversary edition of the extraordinary international bestseller, including a new Foreword by Paulo Coelho. 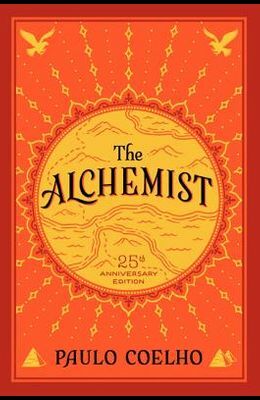 Combining magic, mysticism, wisdom and wonder into an inspiring tale of self-discovery, The Alchemist has become a modern classic, selling millions of copies around the world and transforming the lives of countless readers across generations. Paulo Coelho's masterpiece tells the mystical story of Santiago, an Andalusian shepherd boy who yearns to travel in search of a worldly treasure. His quest will lead him to riches far different--and far more satisfying--than he ever imagined. Santiago's journey teaches us about the essential wisdom of listening to our hearts, of recognizing opportunity and learning to read the omens strewn along life's path, and, most importantly, to follow our dreams. From the Back Cover Paulo Coelho's enchanting novel has inspired a devoted following around the world. This story, dazzling in its powerful simplicity and soul-stirring wisdom, is about an Andalusian shepherd boy named Santiago who travels from his homeland in Spain to the Egyptian desert in search of a treasure buried near the Pyramids. Along the way he meets a Gypsy woman, a man who calls himself king, and an alchemist, all of whom point Santiago in the direction of his quest. No one knows what the treasure is, or if Santiago will be able to surmount the obstacles in his path. But what starts out as a journey to find worldly goods turns into a discovery of the treasure found within. Lush, evocative, and deeply humane, the story of Santiago is an eternal testament to the transforming power of our dreams and the importance of listening to our hearts.